Are you a cash gamer or tournament player? Looking for a quick game or a big MTT? 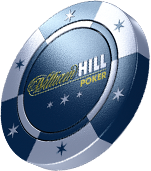 No matter what kind of player you are, there’s a real money game for you in the William Hill Poker App. On the go and running low on funds? William Hill’s mobile cashier allows you to manage your William Hill account funds, no matter where you are. Make a deposit, transfer funds, and withdraw your winnings with a simple push of a button on your mobile device. tournaments prizes every month as well as an exciting line up of land based packages. enjoy the games and tournaments going on now, at one of UK's Top Poker Sites.